LG has continued its pre-CES preparations by announcing a new 100-inch Laser TV System complete with a short-throw projection unit. The Hecto system brings a special 100-inch screen and features a projector that fills the screen with 1080p video from just 22-inches away. The projector also boasts Smart TV and Digital TV functionality, 3 HDMI ports, audio outs, a 10w speaker and can be placed near the floor in front of the screen, rather than having to be attached to the ceiling. 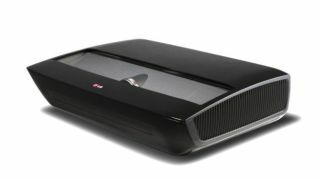 LG says the system, built using its laser-based Illumination technology, will provide a better option for those without the space to hang a traditional projector and bring cinema-style viewing to the home. As well as 1080p full HD video, the projection unit offers a 1,000,000:1 dynamic contrast ratio and bulbs that can go for 25,000 hours before they need replacing. The screen itself is based on LG's Cinema Screen design, meaning a thin bezel and near edge-to-edge viewing. Users will also get an LG Magic Remote for their troubles. The unique system will be shown off for the first time at the LG stand during the Consumer Electronics Show, which kicks off in Las Vegas in the second week of January. The company did not announce a price-point or release date for the Hecto system, but we'll probably find out more at CES.